Today, Monaco Princely Palace hosted traditional Children's Christmas ceremony as it does every year. 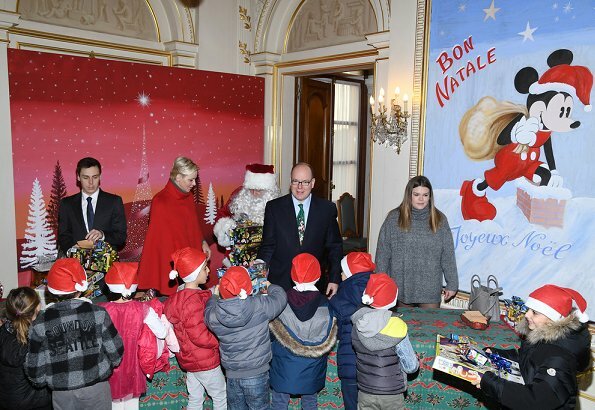 On December 20, 2017, Princess Charlene, Prince Albert II, Louis Ducruet and Camille Gottlieb attended Children's Christmas ceremony held at the Princely Palace and gave Christmas gifts to Monegasque and refugee children. 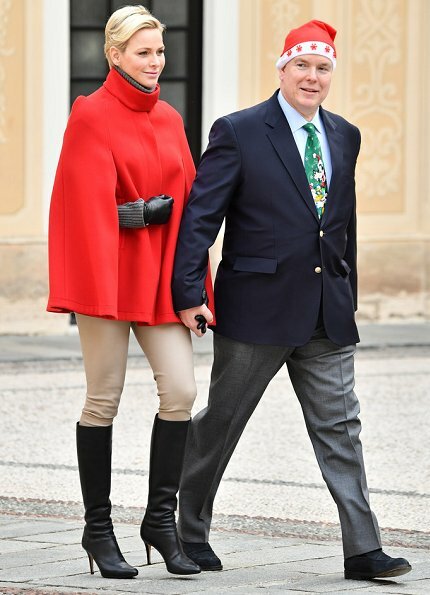 Perfect choice- red cape with high boots and beige trousers. I really like Prince Albert's tie. Very suitable for this occasion. She looks great. I don't like capes but she looks practical and stylish. Bright red suits her really well. Oh tres chic! Love the cape!!! They both look great, nice couple. ik geniet er zo van !!!! charlene looks like a model, she looks georgeous, beautiful wow!! Agree with you suzy. Magnificent can be added!!! Gorgeous lady, and with such style.